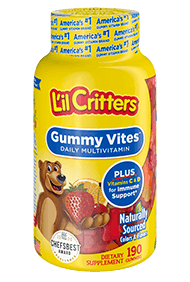 As the #1 kids’ gummy vitamin brand†, L'il Critters™ Gummy Vites™ gives kids the great taste they want, in a fun gummy bear shape they love. With nutrients like Vitamins A, B-12, B6, C, D and E, parents can trust that their kids are getting the essential vitamins and minerals they need to support healthy growth and development. * Plus, Gummy Vites™ have naturally sourced Cherry, Strawberry, Orange, Pineapple, and Blueberry flavors, and no high fructose corn syrup, synthetic (FD&C) dyes or gluten. No wonder Kids Love ‘Em and Parents Trust Them.